Should You Buy An Amazon Echo? - Which? The Amazon Echo is a speaker and a smart hub rolled into one. But is it a match for dedicated hubs, such as the Samsung SmartThings? Of all the smart hubs on the market today, the Amazon Echo is perhaps the most well known. If you’ve seen the adverts then you’ll know that it’s a speaker with a voice-activated assistant built in. The assistant, known as Alexa, can tell you everything from what the weather will be like to how bad the traffic is on your route to work. But that’s not the end of the Amazon Echo’s talents – you can also ask Alexa to control smart devices around your home. Watch our video below to see how well the Amazon Echo understands international accents versus the Google Home. Is voice the best way to interact with your smart home? Find out in our Amazon Echo review. How does the Amazon Echo differ from other smart hubs? The smart hub functionality of the Echo isn’t its most publicised feature, but that doesn’t mean that it’s half-baked. Just like with the Samsung hub and the Swann hub, you’ll be able to control a range of internet-connected devices. But rather than using a smartphone app you’ll be using your voice instead. Simply say ‘Alexa’ in the vicinity of an Echo and it will start listening. This is enough for most simple commands such as ‘Alexa, play songs by The Rolling Stones’ or ‘Alexa, set a 30-minute timer’. However, the possible uses of an Echo expand significantly thanks to ‘skills’. Skills are like apps for the Echo. Heading to the skill store on the Alexa smartphone app will let you download and enable the skills that let you control your smart home devices. 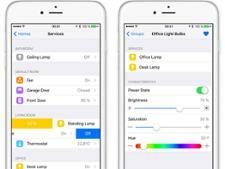 If you enable the Philips Hue skill, you will be able to control your light bulbs with voice commands such as, ‘Alexa, dim the living room lights’. All the available skills are free to download, but that doesn’t mean they’re all worth having. For every useful smart-home control skill there’s another that’s less so, such as the skill that asks Alexa to tell you how cool you are. Still, they are all free so maybe there’s no harm in getting Alexa to boost your self-esteem. Other smart hubs would require you to use their own dedicated smart-hub app to control your smart devices. Amazon has split its new Echo smart hub into two versions, giving us the Echo (2nd generation) and the Echo Plus. The Echo Plus looks more akin to the original Echo, but Amazon claims it has improved speakers and added technology to make it easier to connect up smart home gadgets. Log in or sign up to see if it's worth the extra cash. 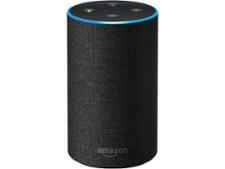 As a hybrid of music speaker, smart home hub and Alexa voice-activated home assistant, the Amazon Echo was a truly unique product when it first came out and it went on to sell by the bucket-load. The second generation model is claimed to be an improvement, but can Amazon stay ahead of the smart hub pack? What are the drawbacks of the Amazon Echo? Using your voice to control your smart home is intuitive and, thanks to excellent voice recognition, a joy to do. But it’s not without its drawbacks. If you are out of earshot of the device then it won’t pick up your commands. Whether the Echo can hear you or not will depend on how much background noise there is and how loud you are, but if you aren't in the same room then don't expect to be heard. Amazon has a remote that you can speak into if you are too far from your Echo to be heard, but this is no good if you are out of the house. What's the difference between the Echo and Echo Dot? The Echo Dot may be a fraction of the size of the Echo, but the differences between the two are even smaller. In terms of their use as a smart hub and voice-controlled assistant, both the Echo and the Dot are identical. The main difference is in the speaker. The full-size Echo is designed to be a Bluetooth speaker in its own right. The Echo Dot, on the other hand, is for people who want to use an Echo with their existing speakers or hi-fi. The Echo Dot still has a speaker inside, but we wouldn’t recommend playing music through it. It’s really only supposed to relay Alexa’s responses. You can find out what we thought of the Echo’s sound quality in our Amazon Echo speaker review. The Dot can connect to your existing speakers via Bluetooth or by using a 3.5mm cable. Then any music or vocal responses will come through your superior-sounding speaker. It’s worth noting that the Echo and the Dot have the same physical buttons – volume control, mute and one to get Alexa listening without saying her name. What's the Amazon Echo compatible with? Unlike many smart hubs, the Amazon Echo doesn’t come with any devices. 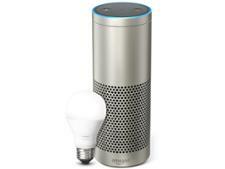 In fact, Amazon doesn’t make any smart-home devices, such as security cameras and motion sensors. Any extra connected tech you want to add to your Alexa-controlled home will need to come from other companies. Looking through the skills store shows that Alexa is compatible with some of the most popular smart devices. Samsung smart products, Philips Hue light bulbs, D-Link smart plugs and Hive thermostats can all be controlled with an Echo. You can find a full list of all the Echo’s compatible devices in our full Amazon Echo review.